I made Suya last night. For those who don’t know it’s a delicious West African snack usually made with beef steak. It’s very similar to what we may term a kebab. Its unique spicy taste makes it highly sought after by Africans in the diaspora whose palettes refuse to be dampened by Western cuisine. What most people don’t know is that it’s not enough to simply spice the meat and then grill it. The unique taste comes from the fact that a dry peanut rub is used on the meat. You want to know how to prepare it? Purchase beef steak. – Ask you butcher to slice thinly then cut into strips. Add Suya Powder – Can usually be purchased in African grocers/Halal butchers and contains the peanuts along with usually some powder garlic etc. Add Suya Pepper – Don’t let anyone tell you suya pepper is enough. You need BOTH the Suya powder and Suya pepper. Add Maggi Cubes – Develop a feel for how much spice to put on your meat. I don’t do measurements. Add Other Spices – Add spices you feel with compliment this dish but don’t overdo it. I used a Kebab Spice Mix I picked up in Dubai. Massage the Meat – Rub the spices in until you can feel the meat starting to absorb it. Stick ’em Up – Soak your skewer sticks in water then impale the meat trying to keep the meat pattern as flat as possible. Marinate – If you have time, let them marinate in the fridge overnight, but due to the strong spices make sure they are well covered. If you don’t have time, go to the next step. They’ll still be tasty. Grill – Grill them until they are a rich coffee brown. 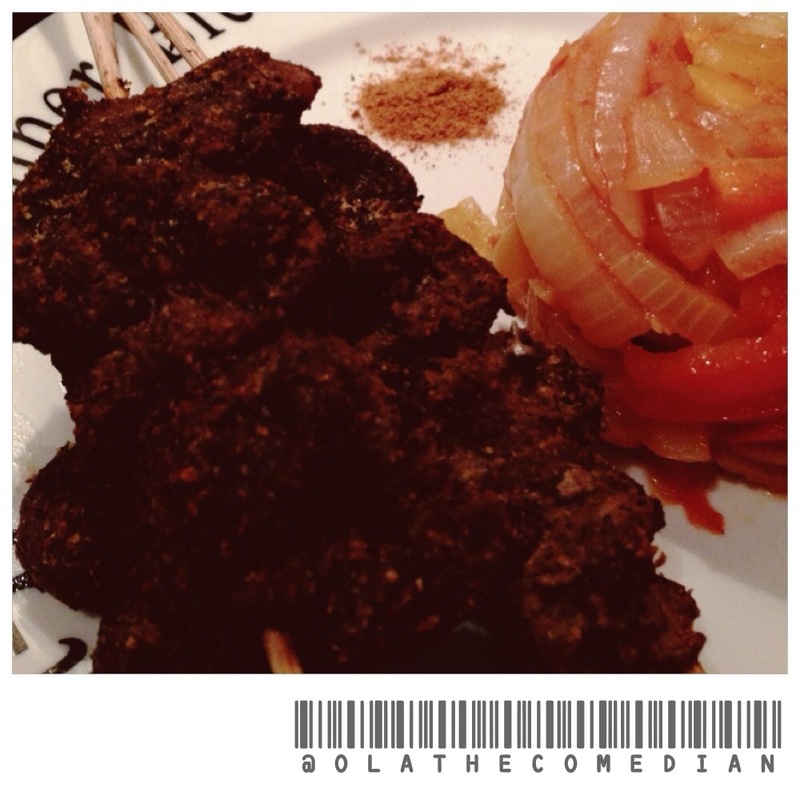 Serve with (red/white) onions, peppers and some suya pepper to dip the Suya in. If you can’t be bothered to make it, we do serve it at the Comedy Club I co-own, Norbury Comedy Club. See you there. This entry was posted in Arts, Food, Swag and tagged african, beef, butcher, cuisine, diaspora, dish, dry, food, ghana, ghanaian, grill, grilled, halal, kebab, meat, nigeria, nigerian, peanut, pepper, rub, skewer, snack, spice, spicy, stick, suya, west africa, west african. Bookmark the permalink.